The Dutch company RemetzCar has some history modifying Teslas, making an elegant hearse that was allegedly the first stretched Tesla ever. Now, by commission from “Dutch collectioneur Floris de Raadt” (what the hell is a “collectioneur?”) they’ve made what they’re calling a Tesla Model S Shooting Brake, even though this thing is clearly a wagon and not a shooting brake. Okay, okay, simmer down, Richie Von Rich. Yes, it looks great, and the already elegant Model S design translates remarkably well into a station wagon. Notice I didn’t call it a ‘shooting brake?’ That’s because words mean things, RemetzCar. There’s a reason why you don’t go into a restaurant and ask for a cheeseburger and get handed a drowned raven: It’s because the words you say mean specific things. And that’s also why this is not a shooting brake. A shooting brake has, at most, two passenger doors. A shooting brake is based on a two-door car with a generally sporting character. It’s a sports car version of a wagon. It cannot have four doors, because a four door car with side windows for the cargo area and a roof that extends at least 50% over an interior cargo floor is a station wagon. We’ve seen carmakers debase the term coupé and have it refer to four-door cars, which is absolutely does not. We must not let this happen to the term “shooting brake” as well. This Tesla station wagon, while not a shooting brake at all, is a great-looking car, and if you have the money RemetzCar will be making 20 of these, so you can even own one. 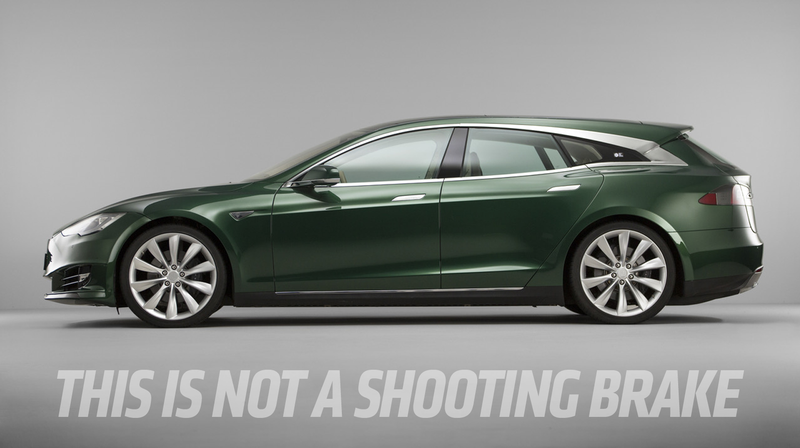 But if you call it a “shooting brake” then you’re ruining everything and nobody will like you, ever again.